So to make up for my delay in sharing my looks, I'm discussing looks 3 & 4 today! Then tomorrow will be 5 & 6 and we should be back on track! Look 3 is a very basic uniform. 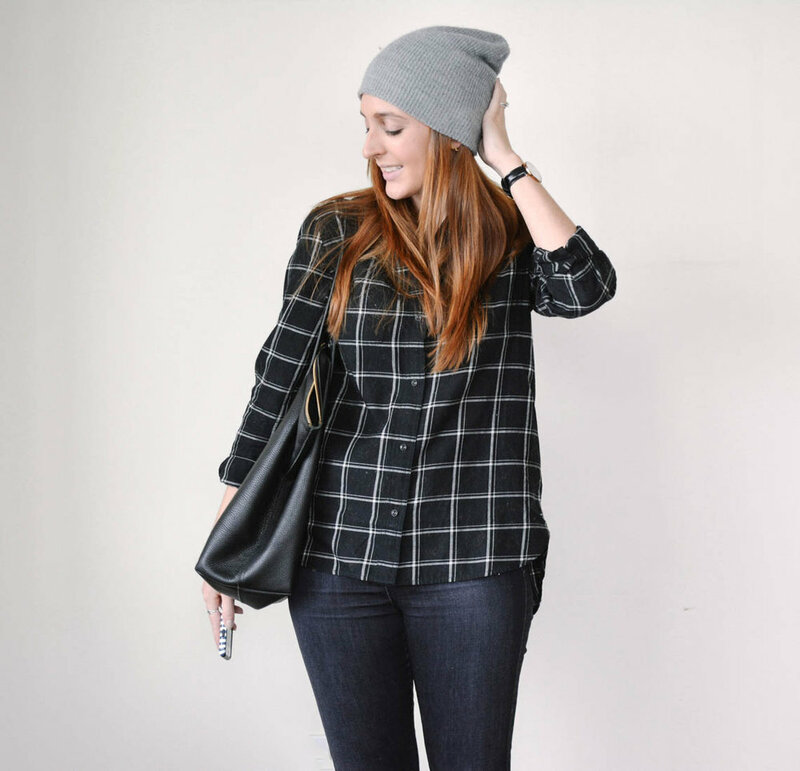 Button up + skinnies + favorite walking shoes and a beanie to complete the look. The most basic of street style. The second is another personally favorite. Simple striped turtleneck + cozy oversized sweater coat + skinnies + those favorite walking shoes again! I'm not really sure why I have any other shoes in my wardrobe right now because clearly I have an unhealthy obsession with these. I feel extremely comfortable in both of these looks. While I initially wanted look 3 to have a little more muchness, I now see that a simple outfit can also make a statement and have its' own place in your style. And look number 4 has moved through the rankings and is now at the top of my favorites list! FAKE CROP - I do this all of the time when I wear high shaft ankle boots. I hate it when my jeans bunch and I'm not fond of tucking skinny jeans into ankle boots. So instead I go for a fake crop look by folding my jeans under. Every one in a while I'll try cuffing them but I always seem to opt for the fake crop instead. I tried on this outfit right after shooting an outfit where I was wearing my Everlane Brixton boots and forgot to un-crop my jeans! Once I got the outfit put together and looked in the mirror I realized that I liked the crop with this look! It adds just the tiniest touch of extra skin to make the leg line look more intriguing. Overall two thumbs up for a fake crop! UNEXPECTED SHOES - so this shoe choice isn't what I would classify as ground breaking. But this time last year I would have paired the black version of these loafers with this look instead. All black outfit = a black shoe of course! Well I'm happy to say that this challenge forced me to think a little more open minded. Since I have worn my Brixtons in almost every look I wanted to push myself to wear my olive loafers. They deserve love too! So when I put this look together I went for them and I'm so glad I did! The different color shoe is just what I needed to balance out all of the black that is in this look. Then topping it off with a light color beanie made the whole look feel complete. My main lesson from this look is if you're trying to broaden your style put on an unexpected shoe! You might be surprised with the new combinations that you find! SIMPLICITY - originally I thought that this look was far to basic to share in my challenge. But then I realized not every outfit can be an out-of-the-box style phenomenon. And every outfit shouldn't be. Sometimes the most basic outfits can make a statement and show the true base of your style. To me this look represents my tendency to drift towards street while still looking clean and put together. See how you can learn about your style even with the most basic outfits! So awesome. This outfit every day all day! I love that high waist silhouette! To me this is the winter version of some of my summer looks involving crop tops and high waists. I'm happy that I could find a way to carry it over into the colder months. I wore this look on a rainy day in Chicago and it kept me all kinds of comfy. A touch of style + all of the comfiness = a 10 in my book! TUCKED IN - I'm obsessed with fully tucking in my shirts in the winter. First, you don't have to worry about a sneak cold breath getting through. Second, it helps me show off that high waist silhouette that I so love. And finally it just makes an outfit look so clean! If my turtleneck was untucked this whole look would have changed. So crazy. I'm thinking this full tuck trend will be sticking around for a while. COMPLETELY WEARABLE - I've already said this a million times when talking about this outfit but it's comfortable. You know those days when you're just exhausted and don't want to get out of bed. Then when you finally do, you stumble to your closet and cringe at the thought of putting anything else on besides your sweat pants? Been there. But this look is now my go-to for those days. I know the turtleneck is not responsibly made but it sure is the softest non-constricting turtleneck I've ever worn. Then add an oversized sweater coat with a giant hood you can hide in?! Magical. Now high waist jeans. You're probably thinking, "I'm sorry. High waist jeans are in no way the same as sweat pants." I completely agree with you. But when you find the right pair that fit you just right without sagging and have just the right amount of stretch. Then you've got a solid pair of work appropriate sweat pants! STATEMENT NECKLACE - this necklace was a last minute addition. I felt that I needed to add a focal point somehow. Something that could also highlight my waist - in a way I guess. I wear my Seaworthy necklace almost every other day so wanted to try something a little different this time. I really like how the gold in the necklace brings out the bright gold zipper in the bag. And the geometric design works nicely with the stripes in my turtleneck. It's like my shoe choice from look 3. Instead of going for the obvious or usual choice try switching it up and giving some love to another piece that might not be as worn in your closet. Stay tuned for looks 5 & 6 coming tomorrow!